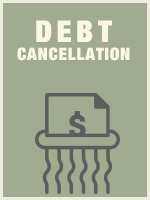 Debt cancellation is an increasingly common occurrence, especially in times of a troubled economy. The forgiveness of a debt not only has economic and financial consequences, but also specific tax consequences and the rules regarding these tax consequences can be complicated. Taxpayers and their advisors attempting to navigate through these turbulent waters will need a compass; this course is designed to provide that compass. Those who fail to abide by the complex requirements of recognizing and excluding cancellation of debt ("COD") income may encounter unpleasant surprises. In this course we will explore the basic rules for both the inclusion of COD income in gross income and the circumstances in which COD income can be excluded; delving into each exclusion in some detail. Using examples to illustrate the application of the rules to specific situations, we will address calculation of the inclusion amount, the consequence of tax attribute reduction following exclusion, and the complicated issues related to attribute reduction in the context of S corporation and partnership borrowers. Recognize the COD income rules. Identify circumstances in which COD income has to be included and those in which it may be excluded from your clients’ gross incomes. Classify how to report both the income resulting from a cancellation of debt and the tax attribute reduction necessary when an exclusion applies. Define key terms such as income and insolvency.